The process of silkscreen/screen printing uses a light sensitive coating to record an image. This chemical coating is called the emulsion. The screen is completely coated with emulsion and then exposed to the light under a positive of the desired image (similar to photography). Afterward, the emulsion washes away from the unexposed areas with water, so the ink will go through and the design becomes a print. Within the silkscreen/screen printing process there are also different kinds of emulsion to use, depending on the kind of ink and equipment you are using. 1. Ulano 925 WR: A lot of beginner start screen printing with water-based inks for their textiles so Ulano 925 WR is a perfect emulsion to start with. 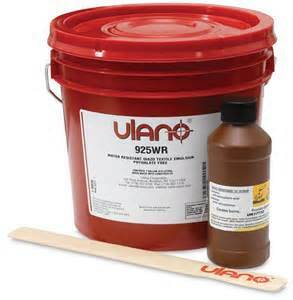 Ulano 925 WR comes with a syrup diazo sensitizer for easy, fast mixing. Beginners usually use the sun to expose their screens; Ulano 925 is the best for this since it has a longer time allowed in the sun (time depends on the UV index) during the exposing process. ~Diazo: This type of emulsion is thick and durable. It is easy to see when the emulsion on the screen is exposed because the color changes. A quart will cover between 20 to 25 screens, if they are the standard 18- by 24-inch size. It can be messy however, and needs to be mixed with a sensitizer or activator before it becomes light sensitive. This emulsion will keep for six to eight months before being mixed with activator, but after you mix it the shelf life is only three months maximum. 2. 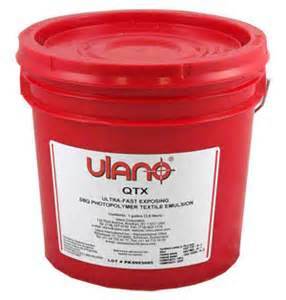 Ulano QTX is an emulsion that is ready-to-use since it does not require mixing like the Ulano 925 WR. It is ultra-fast exposing SBQ photopolymer direct emulsion formulated for textile printing. This high solid content allows for superior coating properties, better bridging of coarse mesh, and it dries fast. QTX is used for plastisol inks, and short run water-base printing. QTX will break down over time if you continually use water-based inks. Do not use strong solvents during the printing or wash-up period. QTX is presensitized, and must be handled in safe light conditions before exposure…no UV light. ~Photopolymer: This is a professional quality emulsion that has much quicker and more stable exposure times. Photopolymer can take the image in seconds and dries fast after being coated. You can apply several coats quickly, creating a thick layer of emulsion that will work well if you are printing on a rougher textile, like sports clothes or denim. Pure photopolymer is often sold “pre-sensitized” so it does not need to be mixed. 3. Ulano QT-DISCHARGE is specially formulated to resist discharge inks and is compatible with water-based and plastisol inks too. You may wonder why people bother with buying the other two emulsions when this one can do it all, and the answer is that people find emulsions that work best for them…it’s just a preference. 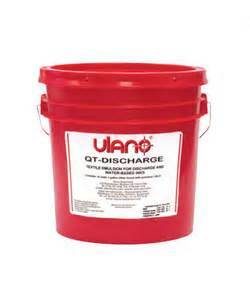 Ulano QT-DISCHARGE requires fewer coats than Ulano 925 WR, dries more quickly and exposes twice as fast. QT-DISCHARGE has a high (41%) solids content, providing good stencil build per coat, excellent mesh bridging of coarse mesh, and fast drying. It utilizes a powder diazo (rather than 925WR’s syrup). ~Dual Cure: This emulsion combines qualities of diazo and photopolymer together. It has a fast exposure time and changes color when it’s finished exposing. Dual cure also gives the screen a heavy coating and holds the image well. Dual Cure does need to be mixed with an activator chemical and has the same shelf life as the diazo. Inexperienced printers can also use it successfully, but the fast exposure time makes it a little more challenging for beginners. Using lower-wattage light bulbs to expose screens can result in images that aren’t crisp or in the emulsion washing out where it’s not supposed to. Instead of spending a lot of time touching up the screen with screen filler, try using dual cure emulsion. Although the Diazo is the most forgiving of the various types of emulsions, it is also the slowest to expose. Dual cure hardens (cures) faster and can especially make a difference for those using a weak source of light for exposure. Use a reliable, industry-supplied light source…like a Ranar CBX Exposure Unit or a Ranar 24×26 Exposure Unit. Certain emulsions must be mixed with a distilled/bottled water. Using tap water which has certain bacterias can ruin your emulsion. For emulsions that you mix allow them to sit for 15 mins before using. Use a scoop-coater to apply the emulsion evenly on your mesh. McLogan has a complete line of great Ulano Emulsions and chemicals for all your screen printing projects. Order online or come into one of our four locations.